Stacy has worked for the USGS since 1999, with her work primarily focusing on water-quality sampling and streamgaging. I started with the USGS in 1999 with the Wyoming Water Science Center as a field assistant with the Yellowstone NAWQA. In 2000 I became a Hydrologic Technician with the Montana Water Science Center in Billings where I have been since. My main focuses have been water-quality sampling and streamgaging duties. I also have been a part of projects such as Environmental Monitoring & Assessment Program, National River and Streams Assessment, NAWQA and most currently assessing hot springs in Grand Teton and Yellowstone National Parks for pathogens. Kinsey, Stacy M.; Nimick, David A. 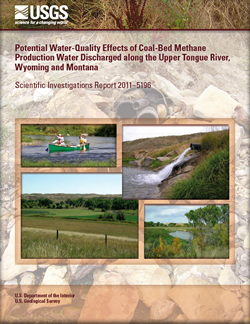 Potential water-quality effects of coal-bed methane production water discharged along the upper Tongue River, Wyoming and Montana; 2011; SIR; 2011-5196; Kinsey, Stacy M.; Nimick, David A.
Cannon, M.R. ; Nimick, David A.; Cleasby, Thomas E.; Kinsey, Stacy M.; Lambing, John H.
Measured and Estimated Sodium-Adsorption Ratios for Tongue River and its Tributaries, Montana and Wyoming, 2004-06; 2007; SIR; 2007-5072; Cannon, M. R.; Nimick, David A.; Cleasby, Thomas E.; Kinsey, Stacy M.; Lambing, John H.
Peterson, D.A. ; Porter, S.D. ; Kinsey, S.M. Chemical and biological indicators of nutrient enrichment in the Yellowstone River basin, Montana and Wyoming, August 2000; study design and preliminary results; 2001; WRI; 2001-4238; Peterson, D. A.; Porter, S. D.; Kinsey, S. M.